Several months into the school year, children usually receive a report card about their academic progress, but – unlike years ago – not necessarily about their social skills and the progress they’re making socially. Talk with your child. First, speak with your child to learn how he or she feels about the process of making new friends, and which aspects your child may find difficult. Maybe it’s simply the introduction or carrying on a conversation. By asking a few questions, you may be able to identify a specific aspect that needs work. Demonstrate social skills that you’d like your child to have. Since children learn many behaviors by copying those of their parents, it’s important to exhibit, especially in front of your child, the kinds of social skills that you’d like your child to emulate, such as kindness, politeness, friendliness, and respect for and toward others. Practice those skills with your child. Once you’ve identified an area that can be improved, practice a scenario with your child that can help your child to better those skills. For example, if your child has trouble saying hello to new classmates, pretend that you or a favorite stuffed animal are a new classmate and hence possibly a new friend, and act out a scenario together. Since there is no pressure, you and your child can practice until he or she feels comfortable with the process. Organize one-on-one activities. Just as is the case with some adults, some children find large groups more intimidating than a single person. If that is the case with your child, set up a few play dates for your child and a classmate. Your child may be able to form a bond with the playmate and then be able to progress toward making other new friends at school. Remember, each child is unique. 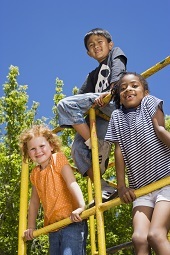 Children learn social skills at different rates and occasionally might stumble along the way. That’s normal. Help your child by talking with him or her and by using some of the above techniques, but don’t be afraid to let your child also learn by trial and error.